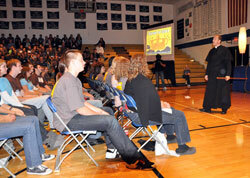 Punctuating faith stories with his Cajun-style humor, the Catholic chaplain for the New Orleans Saints captivated 750 Indianapolis Catholic Youth Conference participants on Nov. 7 at Bishop Chatard High School in Indianapolis. Yet each of his funny monologues ended with reminders that God has a purpose for each of them, and they should pay attention to his call and make the right choices in life. As the teens listened attentively, he presented an amusing interpretation of the creation story from the Book of Genesis. But the moral of his talk was serious. During his childhood in New Orleans, he said, his mother taught the Ricard children an easy-to-understand lesson on how to live out the Ten Commandments in their daily life. And he knew there would be major consequences because he had disobeyed her orders. By the ninth grade, he told the teenagers, they already know right from wrong and should stay out of trouble. The same rule applies for warnings about the danger of using drugs and problems that arise from premarital sexual relations, Father Ricard said. “All I need to tell you is [that] God told you right from wrong and gave us Ten Commandments. … Follow them and you’re going to be all right. The Catholic Church has “a way of getting rid of stupid stuff,” Father Ricard said. “It’s called the sacrament of penance. All you have to do is go to [confession], do the ‘Bless me, Father, for I have sinned’ part, and just start off with ‘I’ve been stupid’ then list your degrees of stupidity. It’s that simple. Before “The Pill” and the sexual revolution of the 1960s, most couples waited until marriage before they engaged in sexual relations. When chastity became—in the view of millions—“old-fashioned,” social and moral upheaval followed. Abortion was legalized in 1973, divorce rates soared, families splintered and children suffered. Pope Benedict XVI is continuing Pope John Paul II’s call for a “new sexual revolution”—a countercultural one that stresses real love, respects the sanctity of the body, strengthens families and lays the foundation for marriage that draws both partners closer to God. That was the message delivered by Louis and Rebecca Paiz, youth ministers at Our Lady of Mount Carmel Parish in Carmel, Ind., in the Diocese of Lafayette, during a Nov. 7 workshop at the youth conference. “Right now, you are starting to prepare for marriage,” Louis Paiz told a classroom full of teenagers. The Paizes have been involved in high school youth ministry for 13 years. They were married in 2001, and have four children. They have spoken together and separately at retreats and youth conferences across the United States. In their presentation, titled “Pursuit of Glory in Others,” they talked about their lives before and after marriage, the importance of chastity, and how human relationships should reflect God’s love. Rebecca Paiz said that she dated a college man when she was in high school. She wanted to be told that she was beautiful, that she was loved. The relationship turned toxic. “If you’re in a relationship and you want to keep it a secret, I’d say, ‘Get out,’ ” she said. “God is the father of truth. If what you are doing can’t be seen in the light, ask God to clean it up. She said she would rather see her children get to heaven than attain the usual career goals. Worldly “success,” after all, she said, is what you make of it. Chastity should be seen as a positive lifestyle because it brings a person closer to God. She said that temptations should not be indulged or repressed, but brought to Jesus for redemption. Boundaries in a relationship should be set in advance through prayer, “not when you’re lying on a couch [with a boyfriend or girlfriend] … in the dark,” Rebecca Paiz said. Teenagers who have abandoned chastity should go to confession, receive forgiveness and vow to start their lives anew. God has a plan for each of us. Dan Harms and Kyle Heimann are proof of that. The duo, who make up the Catholic musician and speaking team known as Popple, met after Heimann graduated from Purdue University in West Lafayette, Ind., and began working as a full-time youth minister. Harms came in as a student and started volunteering with Heimann’s youth program. They began playing, writing and recording music, and now travel around the country “sharing their unique blend of comedic-acoustic-fun-loving music and their passion for their faith,” according to their Web site, www.popple.us. Harms and Heimann were the masters of ceremonies and program presenters at the Indianapolis Catholic Youth Conference. Their message during a workshop resonated with the young people in attendance. “God is calling us all to something,” said Heimann. “True happiness is following … where God is calling us,” added Harms. To get there, individuals need to be “quiet for a little bit” to listen to how God is calling them, Harms added. No matter what one’s vocation is, he said, we each need to strive to be better servants of others. Bishop Timothy L. Doherty of Lafayette was the principal celebrant and homilist for the youth conference Mass. Elizabeth Stange, a high school senior and member of St. Teresa Benedicta of the Cross Parish in Bright, said her faith is re-energized by attending events like the Indianapolis Catholic Youth Conference. “I love it,” said Elizabeth, who earlier this year attended the archdiocese’s Consumed retreat and participated in the “One Bread, One Cup” liturgical leadership conference at Saint Meinrad Seminary and School of Theology during the summer. Listening to the talks, she said, and “getting the spiritual high that it gives you … helps carry you through” life’s challenges.